Gator is some testy tasty nom noms. And it's the best food source of calcium there is. Farm Raised Alligator (Alligator Mississippiensis) tail meat. Are you sucking gator marrow or something? I've had it on vacation to Florida, it was okay, nothing special and a bit chewy. (08-01-2018, 08:22 PM)Meh Wrote: I've had it on vacation to Florida, it was okay, nothing special and a bit chewy. A bit chewy? LOL at some point you just have to swallow it. 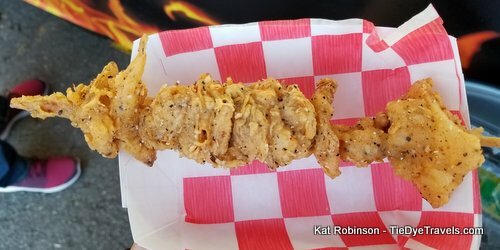 Seasoned with Cheyenne pepper, deep fried on a stick is very popular. Otherwise, I generally marinade overnight and grill in with yams. Coleslaw on the side with extra sweet corn bread. That looks great, I'm starved. I love gator tail, tis a Florida specialty. I miss the raw oysters more than anything.